The retro world of today leads to a lot of creativity and opportunities. 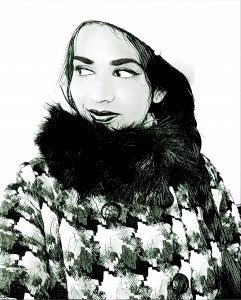 You have the freedom and space to create authentic vintage style looks, you can mix different eras to create your unique look and you can give your own cultural touch to your style. The great thing about the #instaworld? You can get inspired by persons on the other side of the world. 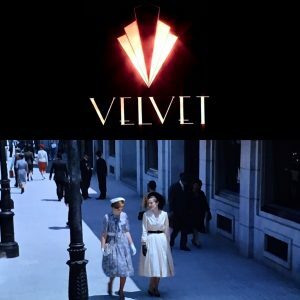 In the vintage style world their are many unique styles represented. But oriental meets classic vintage style? Not so much. A long time ago, I started following Laila Shalimar a.k.a. 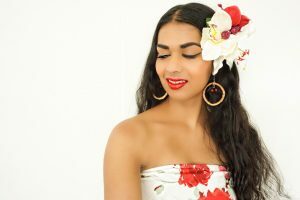 TheDesiPinup who is located in Australia. 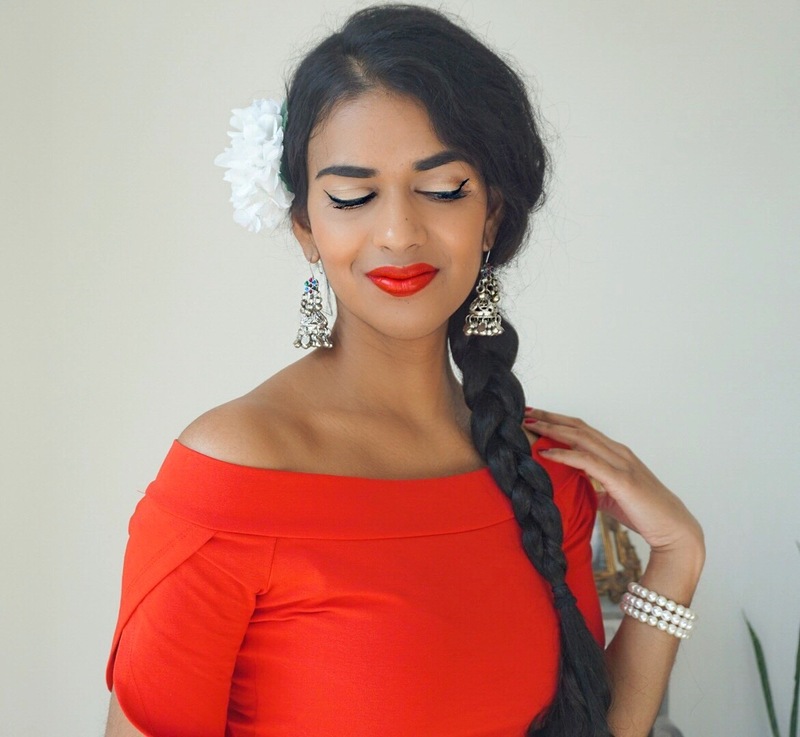 I was pleasantly surprised that there were more South Asian women who love the retro style. Especially at that point I didn’t knew any. Besides South Asian inspired looks she also shares straight to the point messages with regard to Desi meets Pinup”. I was even more pleasantly surprised when I found out recently that she co-created a desi inspired retro jewelry collection with Daisy Jean Floral Designs. Daisy Jean Floral is a retro jewelry accessory shop in Australia. All jewelry and accessories are handmade. I received a few beautiful pieces of this special collection that is South Asian/Desi inspired. I love this collection, because it includes an inspiring cultural background story, but on the other hand these pieces are wearable for any person regardless of their cultural beliefs or background. Let’s take a look at some of the beautiful pieces from this collection! Starting with a very pretty hair flower. You might have read my story about hair flowers. Way before I entered the retro style world, hair flowers were part of my accessory wardrobe. That has everything to do with (Old) Bollywood. I was always fascinated about the gorgeous hair flowers that were worn by Indian actresses. This hair flower really reminds me of those golden Bollywood years. The hair flower is very light, you hardly notice you’re wearing a hair accessory. This Hair Clip instantly gives me Old Bollywood vibes. 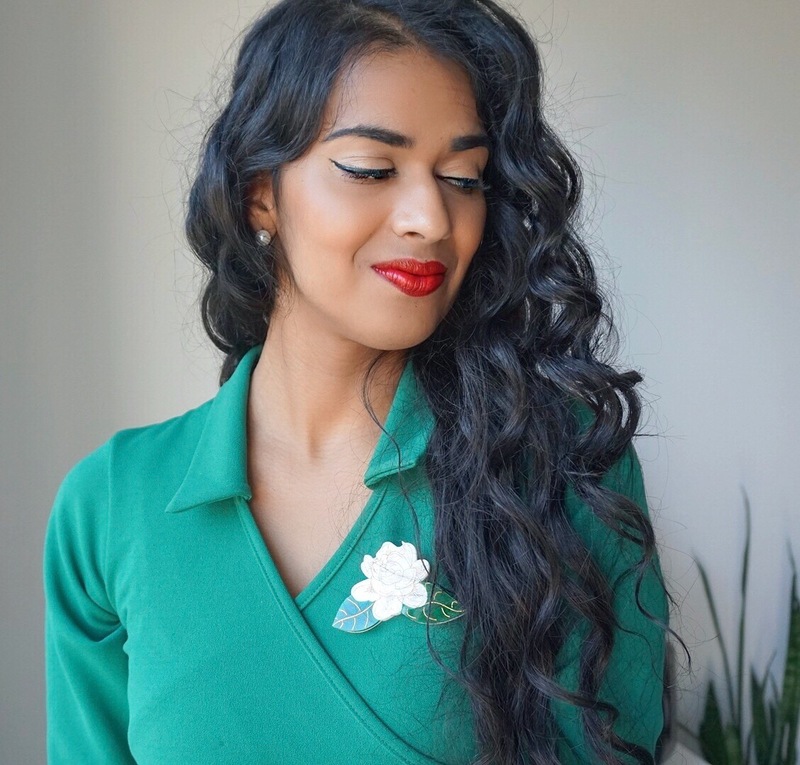 I usually want to create a desi inspired pinup look when wearing this hair clip. 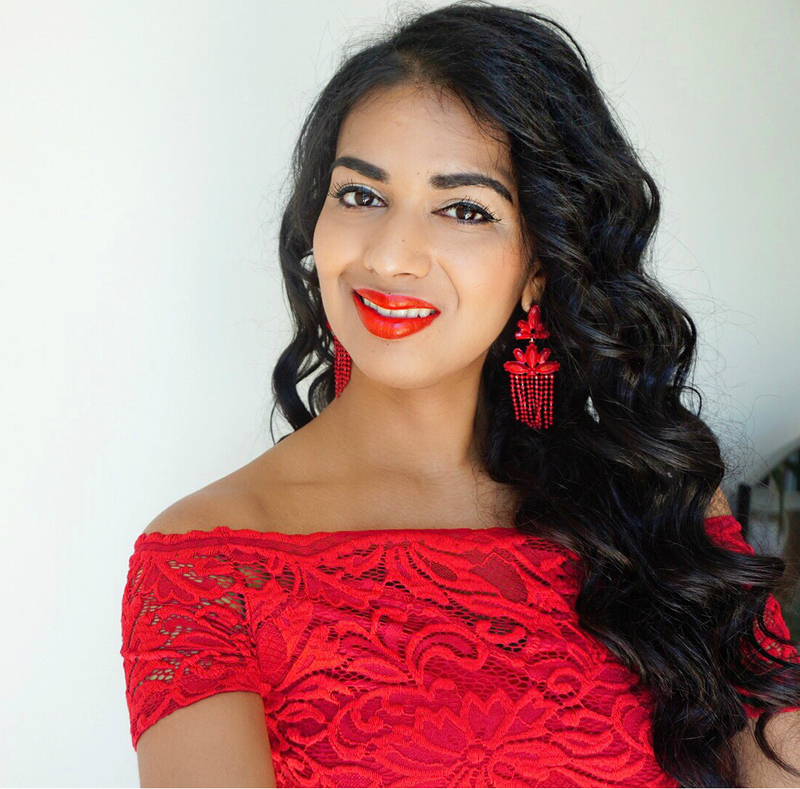 The formula is easy: wear red, wear indian jewelry (in my case jhumka earrings). Last but not least, a bold makeup look including a winged eyes look and bright red lipstick. This one became one of my favorite brooches. Instant flower power with that desi touch and it’s really an eyecatcher. All brooches from this collection are laser cut acrylic pieces and it shows. 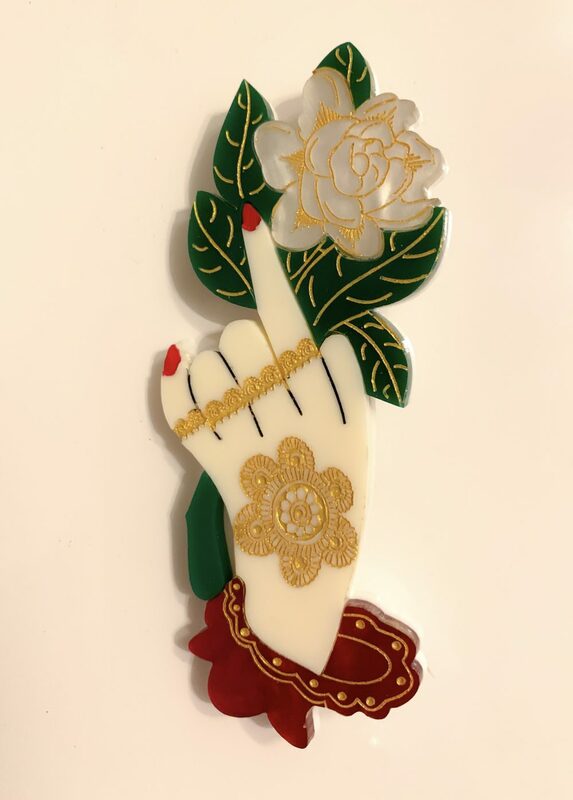 This brooch can be used to flower up any dress for any occasion, from work mode to after-work diner. I usually wear this in combination with the colors green and yellow. Also read: Retro bikini time! This brooch is an ode to the art of henna (also known as mehndi) in South Asia. The great thing about this brooch is that it also comes in 3 skintone colors. It’s a truly beautiful and especially unique brooch. It’s a perfect example of blending vintage inspired designs with South Asian culture. It’s design is very detailed and actually includes a simple gold desi bridal design. 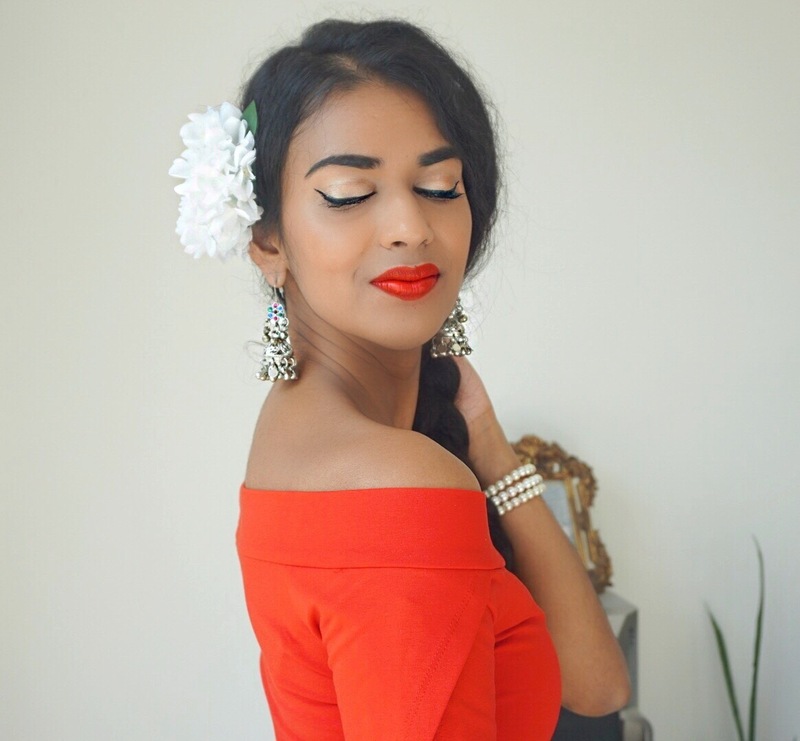 Find the full range of The Desi Pinup Collaboration here. This collection is available until the end of the year. Follow me on instagram for more Oriental inspired retro looks.